SimpleFX (official website) – Forex & Cryptocurrencies online CFD broker. Established at 2014, registered at St. Vincent and the Grenadines. SimpleFX is one of the first STP broker which started offering crypto currencies CFDs trading, and accepting crypto payments from the beginning of launching its trading platform. SimpleFX has 140+ symbols in their offer including: Forex, cryptocurrencies, indices, commodities, metals, stocks (USA, German, Japanese, Swedish). Crypto trading is available 24 hours per day, 7 days a week. SimpleFX offers MT4 trading platform which is available on Windows, OS X and Linux. SimpleFX has also developed innovative web trading platform. SimpleFX offers floating spread depended on market conditions. Scalping, hedging is allowed, you may also use FIFO and one-click trading on web based trading platform. SimpleFX has a shoutbox to discuss current markets situation with other traders. Only email registration is required to sing up. At SimpleFX you can open an account in 19 base currencies. You may choose to add up to 10 Live or 10 Demo trading accounts, freely choosing account currency. You can adjust your account leverage from 1:2 to 1:500. You can also choose preview currency. Leverage levels details are listed below. Crypto accounts aretotally anonymous and are available for these coins: Bitcoin, Bitcoin Cash, Dash, Ethereum and Litecoin. SimpleFX does not charge any fees for processing crypto deposits or withdrawals. Funds are credited to client`s account after 1 blockchain network confirmation, which usually takes about 1 hour. Crypto withdrawal requests are processed within 24 hours. Verified accounts are for traders who would like to deposit hard currency. 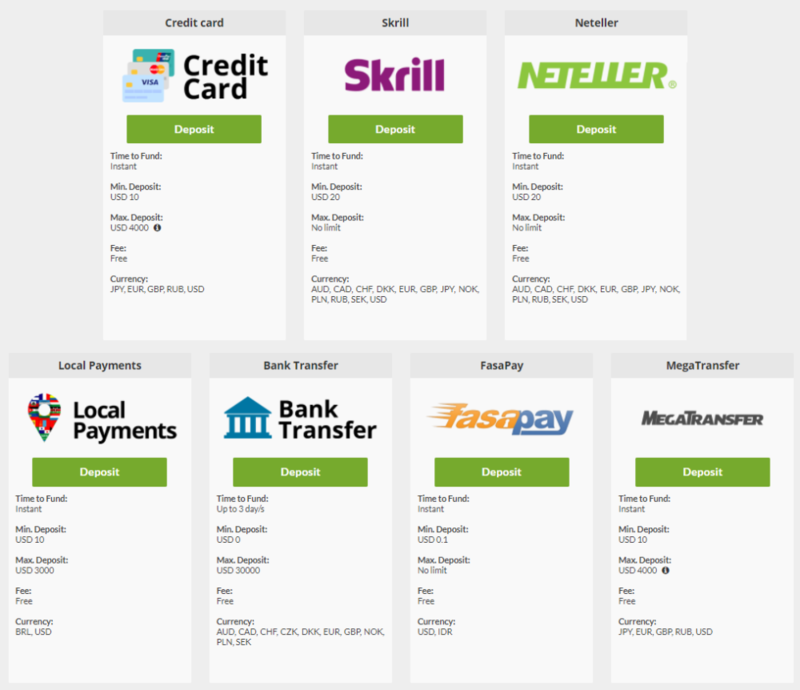 SimpleFX accepts these currencies: AUD, BRL, CAD, CHF, DKK, EUR, GBP, IDR, JPY, NOK, PLN, RUB, SEK and USD. SimpleFX offers multi-level affiliation connections. You will receive up to 25% of the trading spread from directly referred clients. You will earn 5% of your clients` revenue share, which they earn from the traders they have referred directly. Referral program is lifelong and not limited on time. SimpleFX affiliation system is based on cookies, you do not need to deposit funds or verify your identity to join the program. You can test SimpleFX without even signing up to their trading platform. Guest mode will allow you to open your first trade, set stop loss, take profit. 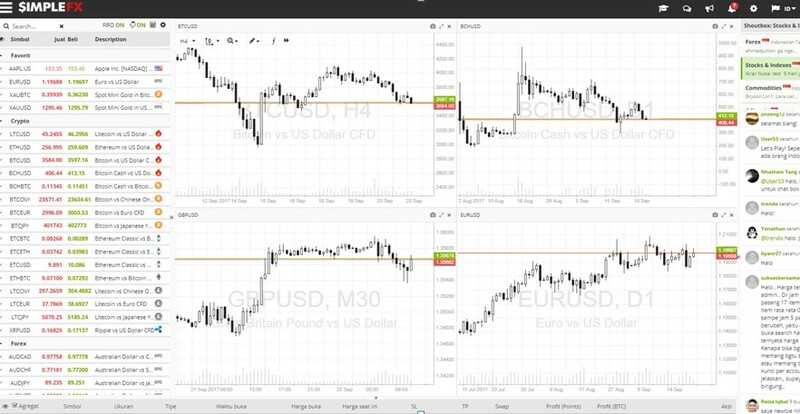 Click here to check SimpleFX video tutorials – you will see how to use webtrader. SimpleFX gives you up to 10 Demo accounts to test your trading strategies, all trading conditions are the same as on Live account. You can adjust your leverage, change your account balance, perform internal transfers between hard currencies accounts or between crypto accounts. Trade calculator is a tool which can help you make a trading decision. You may enter trade parameters and check how much potential profit or loss you will make. It shows also required margin to open given trade, daily SWAP values, point value.